To maintain a luscious green lawn, the soil is aerated by perforating it’s surface that allows water, air and nutrients to penetrate the grassroots. That’s the science behind the Dermal Roller SR. 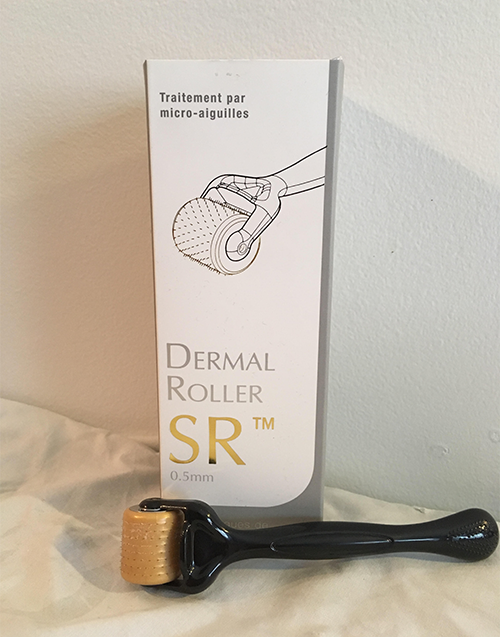 The Dermal Roller SR is a hand held medical device that boasts similar (and sometimes better) results than laser treatment, chemical peels and dermabrasion. It’s the cost-effective take home treatment to combat the appearance of scars, wrinkles, stretch marks, cellulite, uneven skin tone and even hair loss. It’s suitable for all skin types and sensitive areas, like around the eyes. The Dermal Roller SR microneedles the skin in a rolling motion which naturally stimulates collagen production and prompts the body’s healing process. The fine surgical needles on the roller, ranging 0.5 to 1.5 millimeters long, create tiny punctures (also known as micro-injuries), enabling the skin to open to receive nutrients for a full hour after rolling. Cleanse your face with Dr. Anna’s Face Wash and pat dry with a clean towel. Apply pressure to your comfort level when using the Dermal Roller SR to aerate your skin. Pay particular attention to the crevices of your nose and chin, and don’t forget to roll along your neck. Now that your skin is open, apply Skin Rejuvenation Mesotherapy Solution which mimics your skin’s natural nutrient-rich plasma. Keep the solution on your face for at least an hour after rolling. You may want to use another cream or serum—discuss your options with Dr. Anna. The Dermal Roller SR can be used as a standalone therapy, or as a maintenance tool following an in-office Platelet Rich Plasma (PRP) treatment. You can use the Dermal Roller SR every three days, depending on how long it takes for your skin to recover. Patients report slight swelling and puffiness straight after rolling, which usually subsides within a hour. Your roller is good for approximately ten treatments—any more than this, and the needles will start to dull. Store your roller in the plastic protective capsule that it comes with, and clean it with Isopropyl (or denture cleaner—it really works!) before and after every use. Store your Skin Rejuvenation Mesotherapy Solution in the fridge. Visit Dr. Anna’s Facebook page to watch a video of the Dermal Roller SR in action.